Vitamin A	3 250 000 I.E. Vitamin D3	625 000 I.E. Amino-Witax is a preparation based on yeast, enriched in vitamins. Its formula satisfies the needs of the organism for amino acids and vitamins A, D3, E and C.
Application of the preparation accelerates muscle regeneration after exertion, enhances the immune system and helps to reconstruct the mineral balance in the organism. 1 tablespoon per 600 g of food poured with garlic oil or other cold-pressed vegetable oil or liquid vitamin preparation. 1 tablespoon per 600g of food per 30 birds. It is worth mentioning that, due to the mechanism of the Aqua-Septic preparation affecting bacteria and fungi, there is no risk of these micro-organisms becoming resistant to components of the preparation as it happens in the case of numerous antibiotics. It is essential to apply Aqua Septic systematically all year round. This considerably decreases the danger of occurrence of diseases in the digestive system, as well as possible microbiological poisonings, such as salmonellosis. Additionally, it is advised to apply the preparation both 2 days before and 2-3 days after antibiotic therapies, since application of an antibiotic in the event of a subclinical condition of fungal infection of the intestines may lead to fungal diarrhoeas which are exhausting for the organism of a bird. Application of antibiotic treatment may involve side effects in the form of upsetting the natural microbiological balance in the intestines, thus, leading to mycosis of the digestive system. This, in turn, may result in relapse of the disease for which the antibiotic was applied or lead to incomplete recovery. 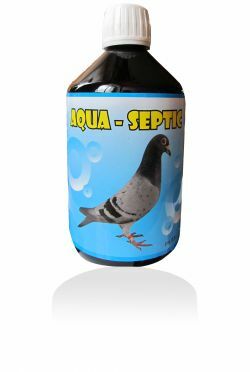 Aqua-Septic considerably reduces the possibility of occurrence of these adverse processes, as well as it supports regeneration of the natural intestinal flora and has a soothing and nourishing influence on irritated epithelium of intestinal walls. capacity: 0.5 l	Birds, on average, drink twice as much water as the amount of food they eat. Therefore, it is crucial so that their water has an appropriate composition and, most of all, it is free from pathogenic micro-organisms. Unfortunately, water in drinkers is very often polluted with food, droppings and with dust, which leads to its contamination with micro-organisms that are dangerous for birds' health. This happens especially in summer, when the ambient temperature supports fast reproduction of bacteria in water. Aqua-Septic is a highly-specialized preparation added to water, containing organic and mineral components which are appropriately prepared, highly concentrated and selected in proper forms and mutual proportions. It is a multi-component product which very effectively improves the quality of water. Moreover, action of one of the components used in Aqua-Septic is soothing and nourishing the epithelium of intestinal villi and this way it improves absorption in the intestines. Other component, additionally applied in the product, is characterized by a strong antifungal action. Aqua-Septic applied with drinking water disinfects it, destroying bacteria from Enterobacteriaceae group, among others E. coli, Salmonella, Clostridium and Staphylococus. A special addition also destroys fungal spores. All these factors may lead to diseases occurring in birds and cause chronic diarrhoeas, weakening their immune system and deteriorating the racing and competitive efficiency. Aqua-Septic also decreases the pH value in the digestive tract, which stimulates production of the pancreatic juice and, in consequence, digestive enzymes: trypsin, amylase and lipase, and improves the process of digestion. By decreasing the pH level in the digestive tract it destroys pathogenic bacteria and, at the same time, facilitates production of normal intestinal flora - bacteria of lactic acid (Lactobaccilus). Its action in the intestinal tract also consists in destruction of fungi which may get there with contaminated water or food and cause diarrhoeas which are difficult to treat. Bioelektrolix is a multicomponent preparation which is a combination of electrolytes, amino acids, vitamins and energetic substances which dissolve well in water and are highly assimilable. The well-selected composition of vitamins decreases the level of hormones responsible for stress conditions and improves blood circulation. The content of mineral compounds (electrolytes) combined with vitamins restores balance to the nervous system and improves heart work. 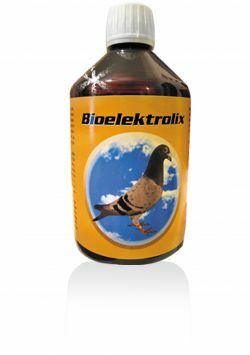 Bioelektrolix also allows to restore correct water balance in the intestines of a pigeon after diarrhoeas, antibiotic therapies or exhausting flights. 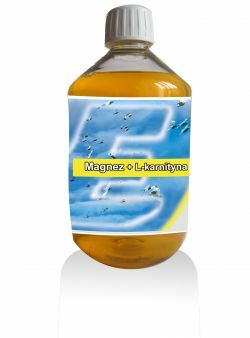 Basic endo- and exogenous amino acids added to the product enable faster regeneration of muscles after flights or passed diseases. Glycine, at the same time, is a necessary component which participates in the process of detoxification of the organism. It binds with toxins created during flights or diseases, so that they are removed by the kidneys and by the liver more easily. Bioelektrolix makes it possible to restore correct metabolism faster and it accelerates the process of strength regeneration. Thus, Bioelektrolix is a preparation of multidirectional action, supporting fast restoration of balance of the organism and of the racing form of a pigeon. The unique composition of components and selection of those of the highest quality and assimilability contribute to the fact that pigeons like drinking water containing this preparation. 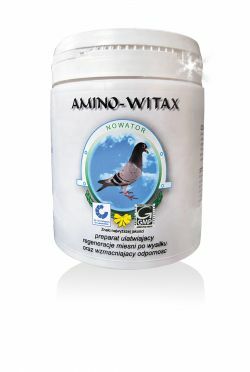 Bioelektrolix, in combination with Amino-Witax (rich in vitamins, amino acids and microelements), perfectly improves change of feathers in pigeons and their quality, since substances contained by both preparations completely supplement the needs during moulting as well as during raising youngsters. 3 ml per 1 l of drinking water. After longer flights the dosage may be doubled. Before application shake the bottle repeatedly. Vitamin A 500 000 IE. Vitamin D3 10 000 IE. Dynamix contains a set of necessary vitamins, mineral compounds and amino acids. Applied in the final phase of racing preparations, it leads the birds to the top of their form. Dynamix is also an excellent addition in the breeding period, in the period of growth of youngsters, during the moulting season and during drug treatment. It contains specific strains of intestinal bacteria and organic acids, which prevent harmful bacteria (causing diarrhoea) from developing. An addition of enzymes helps to use the food better which, in turn, results in a decrease in strain on the digestive system. During the racing season: two last days before basketing of widows. 1 tablespoon of oil or a mixture of cold-pressed oils or a liquid vitamin preparation per 600 g of food, mix and leave for 30-60 minutes for binding and then add 1 tablespoon of Dynamix and mix again. After the mixture dries, apply twice a day. Pour the food with a cold-pressed oil or with a liquid vitamin preparation, leave for 30-60 minutes for binding and then sprinkle with Dynamix. Dynamix may be applied with drinking water in the amount of 1 dessert spoon per 1 litre of water. In the event of application with water, sediment is a natural phenomenon and it does not affect the effectiveness of the preparation. Application of the preparation at the beginning of a week may result in occurrence of racing form too early. In order to increase the racing form, Dynamix should be applied in combination with Turbo-Mix-4. The field of feeding birds is a dynamically developing branch of science. Research concerning the search of new products and substances which would improve the health and functioning of the digestive system of birds, which is one of the most important ones in the organism, is constantly performed. This system supplements nutrients to all organs and systems in an animal organism. 70% of immunity also comes from it. A healthy digestive system is, therefore, a necessary condition of a good stamina of pigeons and their obtaining the best racing results. Gastrofix is an excellent and widely tested product, significantly reducing the threat of occurrence of diseases of the digestive system caused by protozoa, causing such diseases as: coccidiosis, hexamitiasis or trichomoniasis. It also limits occurrence of bacterial infections leading to such illnesses as: salmonellosis, colibacteriosis, campylobacteriosis as well as staphylococcus or anaerobe infections. Extract from oregano essential oils applied in Gastrofix as well as the specifically selected mixture of organic acids (short- and medium-chain organic acids) synergistically prevent the development of the aforementioned pathogens. They are the short- and medium-chain organic acids to which extensive research and numerous scientific discoveries particularly pertain. Mixtures of organic acids of the most recent generation are put on special carriers, thanks to which the release of the active substance (organic acids) takes place steadily, ie. in the crop, stomach and in the intestines of the pigeon - where the threat from the pathogenic bacteria is of greatest dimensions. Therefore, intending to use the most recent knowledge concerning the health and nutrition and to increase the quality and effectiveness of products for pigeons, the current organic acids in Gastrofix have been replaced with a more perfect mixture of the most recent generation. It is based on a new, special carrier which causes a slight change in external image and smell intensity of the final preparation (Gastrofix). This method helped to obtain a product with even greater effectiveness in preventing the development of particularly aggressive bacteria in the small and large intestines in pigeons, significantly reducing the frequency of diarrhoeas. Thanks to slightly reduced smell intensity of Gastrofix (the effect of "locking" acid particles), the product applied with food will be eaten by birds more eagerly than it was so far. 1-2 g (approx. ½ of a dessert spoon) per 1 kg of food previously poured with a cold-pressed oil or other liquid preparation. Mix well. Always prepare a fresh dose before feeding. The preparation may be applied: during a racing season - prophylaxis: 2-3 days after arrival home (in specific cases for up to 4 days). Treatment - for 6 days. In the event of occurrence of coccidiosis or diarrhoea – 3 g (1 dessert spoon) per 1 kg of food for 7 days. In the period of growth of youngsters, promptly after weaning 1-2g per 1 kg of food for 3 days. In the event of diarrhoea or digestive disorders 3g per 1 kg of food for 5-7 days. Store in a cool, dark place, in a hermetically locked container. The product was created in cooperation of medicine specialists from Poland, Spain and Germany. 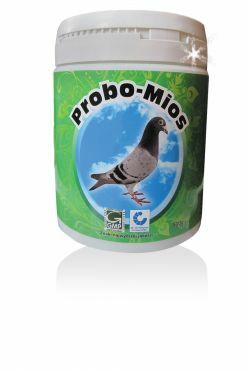 Probo-Mios is a product aiming at reconstruction and maintenance of health and functionality of the digestive tract in racing pigeons. The product contains pure grey-loess, created in natural conditions, coming from the ice age, as well as a set of two strains of probiotic intestinal bacteria. The main component of grey-loess is natural silicic acid, a number of minerals as well as trace elements. Specific properties of the preparation are based on detoxifying abilities of grey loess, consisting in absorption and deactivation of endogenous and exogenous toxins occurring in the intestinal tract. Toxical substances occurring in the intestines most frequently are: mycotoxins (fungal toxins), bacterial endotoxins and products of incomplete protein analysis (amines). Moreover, Probo-Mios regulates the moisture content in the intestines, and therefore it limits the possibility of development of diarrhoea conditions. This feature of the product results from the ability of binding of water and harmful substances, which is several hundred times greater in relation to the weight of the applied preparation. Another important element, which strengthens the positive reaction on the intestines of a bird and is contained in Probo-Mios, are two strains of probiotic (positive) intestinal bacteria. They have been carefully selected, in order to fill the contents of the intestines with positive microflora to the greatest possible extent. This was the manner of obtaining the quickest and the most effective way of reconstruction of normal balance and functionality of the intestines. The probiotic (positive bacteria) introduced by the product produces lactic acid and treating substances in the intestines, which helps the organ to return to a good condition quickly and effectively. An additional advantage of the use of positive bacteria in Probo-Mios is their ability to so-called replacement effect, which means that they attach directly to the mucus membrane of the intestines and therefore significantly prevent these places from being settled by pathogenic bacteria, such as: Clostridium, E. coli, Salmonella. This is the manner how it reduces the threat of occurrence of bacterial diseases in the intestines. Synergistic (supplementary) action of two types of ingredients used in Probo-Mios (grey-loess and probiotic bacteria) makes it a product which has the best influence on good condition of excrements of birds, detoxification of the digestive system of pigeons, as well as restoration of the appropriate, healthy intestinal microflora. Probo-Mios is also a necessary product which should be applied after completed antibiotic treatments for quick reconstruction of normal flora in the intestines. Therefore, Probo-Mios is an excellent "tool" allowing to reconstruct and control healthy functioning of the digestive system - one of the most important systems in pigeons. 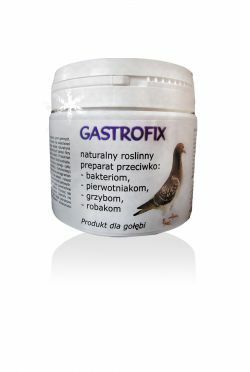 *Combined application of Probo-Mios with Gastrofix is possible in situations of threat of coccidiosis or disbacteriosis of intestines. Combination of four aforementioned substances very intensively influences the process of storage and restoration of energy in the organism of a pigeon. Moreover, it prevents the fatness of internal organs. TURBO-MIX-4 prolongs muscle endurance allowing for longer and more intensive exertion. It leads to a lesser production of lactic acid during exertion, and therefore - decreased exhaustion of muscles. Addition of lecithine improves memory, helps to concentrate, supports physical and mental efficiency of the organism, decreases nervousness and fatigue. Biotin supports energetic transformations in the liver - creation and release of energy stores. The effect of TURBO-MIX-4 is better after addition of cold-pressed vegetable oils to food. Depending on assumed difficulty of flight - last 2-3 days before basketing. Per 30 widows: Mix 600 g of food with 1 tablespoon of vegetable oil or mixture of cold-pressed oils. Then add 1 tablespoon of TURBO-MIX-4 and mix again. After drying give the mixture to the pigeons. 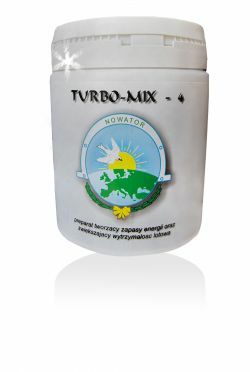 TURBO-MIX-4 should be applied, combined with DYNAMIX, in last two days before basketing. It may be applied with drinking water in the amount of 1 dessert spoon per 1 litre of water. 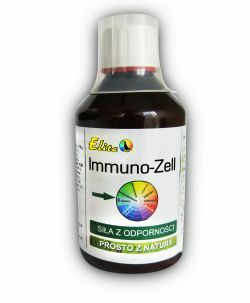 Immuno-Zell is the latest product of the highest quality. 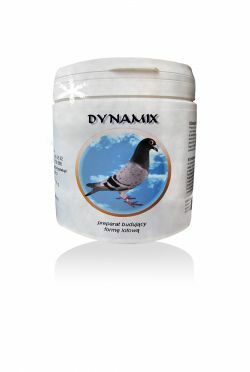 It improves carrier pigeons’ health and immunity. Immuno-Zell – a natural product containing an abundance of highly absorbable yeast, glucans, enzymes, coenzymes, proteins, and vitamins. Glucans stimulate immune cells, which helps the body fight diseases. The administration of Immuno-Zell enables you to raise well-developed young pigeons with a strong skeleton, strong feathering, and well-developed internal organs. In breeding pigeons, Immuno-Zell improves reproductive abilities and has a positive influence on their health state. In racing pigeons, amino acids present in the product rebuild muscles quickly and effectively after tough races. Additionally, Immuno-Zell effectively strengthens pigeons’ immune system, especially in the area of the digestive tract. The product protects pigeons’ intestines against bacterial and fungal infections. It boosts the body’s response to vaccines, which provides the birds with a better protection against diseases. Moreover, Immuno-Zell protects all cells in the whole body, especially in the area of the cardiovascular, immunological, and reproductive system, against damage and early aging. whenever you want to improve immunity and state of health in the flock. Note: if you use Immuno-Zell there is no need to administer Vital-Zell concomitantly! Magnesium + L-carnitine is a high-quality product administered in drinking water to racing pigeons. Its ingredients are highly absorbable. Chelated magnesium used in this product is the most absorbable form of magnesium. Its activity is supported by vitamin B6, which improves the process of absorption and supports the nervous system. Carnitine, on the other hand, cooperates with magnesium, which enhances energy processes in the body of pigeons. Advanced, multi-ingredient product administered in drinking water to pigeons aims to hygienise drinking water and improve the health of the digestive and respiratory system. Because of the way Menthol-Septic affects bacteria and fungi, there is no risk of the occurrence of resistance of these microorganisms to the ingredients of the product (which often happens in the case of the administration of antibiotics). The combination of vegetable extracts and essential oils (for example, cineole, eucalypteole, limonene, menthol, tannins, and flavonoids) enables an effective cleansing of the respiratory tract from bacteria, viruses, fungi, and dust, which reduces the probability of the occurrence of respiratory diseases in pigeons (mysoplasmosis, chlamydiosis, catarrh, etc.). It also alleviates possible effects of thermal stress during hot summer days. It is important to administer Menthol-Septic systematically throughout the whole year, which significantly reduces the risk of diseases of the digestive system, potential microbial food poisoning, and respiratory diseases. 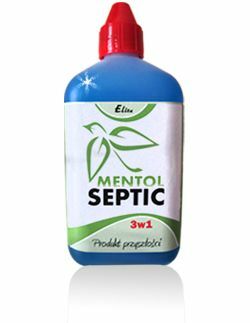 Menthol-Septic also helps reconstruct the intestinal flora, alleviates and nourishes irritated intestinal epithelial surfaces. 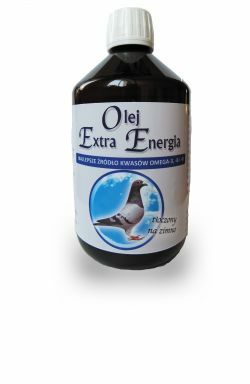 Extra Energy Oil ensures excellent physical condition during flight in pigeons. The ideal mixture of cold-pressed oils is a rich source of omega-6 and omega-3 essential fatty acids, natural vitamin E, phospholipids, fatty acids, provitamin A, and vitamin K. Extra Energy Oil effectively improves motor activity and significantly increases energy level in pigeons. Thanks to Extra Energy Oil the pigeon’s feathers are velvety, the birds are in peak condition, their muscles are rebuilt, and what’s more important, their endurance is increased. Extra Energy Oil can be administered concomitantly with Dynamix, and Turbo-mix 4, Amino-witax, Gastrofix or Probo-Mios, depending on the needs. After adding the oil to feed, wait 1-3h. When feed soaks the oil up partially, you can add other products, for example, Dynamix, Turbo-Mix 4, Probo-Mios, Amino-witax or Gastrofix. Using “Iron-Komplex” regularly 2 times a week, during flight helps maintain maximum concentration of iron and therefore of hemoglobin in the pigeon’s blood. This improves the ability to use the energy from food into the energy of the muscles and the endurance of the flights. organism of the pigeon. It also contains biotin. Sedochol is a very effective and quick way to restore the desired physical state of the liver and kidneys. It aids the purification of the organism of the pigeon. It allows to maximize the usage of energy stored in your birds’ organisms during long flights. Rich in minerals in chelated form and vitamins. The bioavailability of this form for the body of the pigeon is close to 100%, which differentiates Mineral Vit from other products available on the market. Improves digestion, immunity and supports the development of the skeleton. increases quality of the plumage.